I thought he rode Saratoga's turf courses very well and wasn't too shabby on the dirt, either. However, his business -- and victory total -- was down sharply there this year as well. In addition to the Ortizes, Castellano, Cornelio V. and Johnny V., don't forget the development of Manny Franco into an outstanding young rider who did very well at the Spa and was near the top of the standings at Belmont going into the weekend. Joel just won the 1 5/8-mile Temperance Hill at Belmont on Rocketry in 2:40-something, breaking Man o' War's 98-year record. Since there were only five horses in the race, he had to go merely three wide on the turn. Won on 16. MEISHO KAZUHIME (French Deputy) Race 10 at Hanshin. ~ I also really appreciate the “Dumdadumdadum” race call and it’s very fitting. Time to look into your crystal ball a few years or maybe a decade or two from now. We recently saw another running of the Lukas Stakes, a G3 event going 1 1/8 for 3+up and with Biscuits winning I suppose Churchill may be on their way to getting that to be a G1 event for all time, deserving. But what about the other guys.....Baffert & Pletcher? What kind of race should be written in their honor? Well, for Pletcher, I guess it should be one of Florida's preps for the KY Derby. And for Baffert, one of the Southern California preps -- a dirt prep, of course. They could also rename the race at Santa Fe that Real Quiet came out of, but, oops, no more Santa Fe! I think eventually a turf race at Saratoga will carry local-boy-made-good Chad Brown's name. Xpressbet would probably be willing to forego their name being on the Florida Derby, he's won 5 of those so far, the TAP makes logical sense. Going back to New York traffic... and I won't... it can be interesting to be stuck in the middle of an intersection through 3 light changes while your Arabic cab driver is cursing in whatever language he has to practice on that day as the Greek truck driver and Viet Namese pizza delivery man scream at each other over their fender bender. You can ask Tampa Bay Downs if they have a stakes they are bored with. He runs them up here as well as Gufstream. Jockey Angel Castillo suspended 30 days by Penn racing board for not persevering with mounts in Parx races. Someone's big plans are not turning out as planned. Maybe someone didn't do his homework? 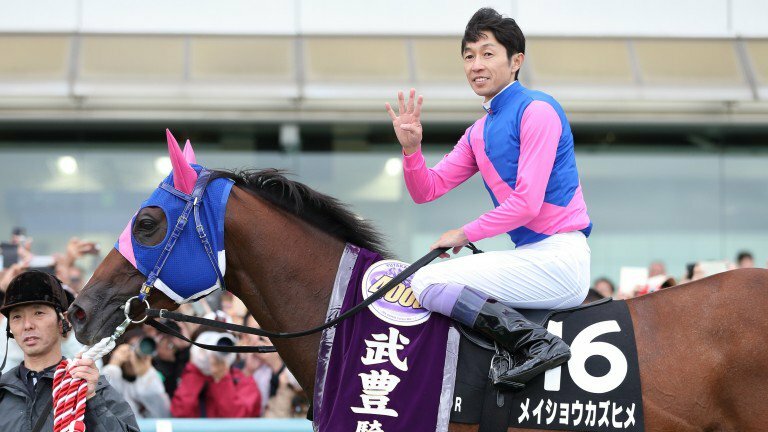 ‘Magic Man’ Joao Moreira looks set to make a sensational return to Hong Kong following his failure to secure a full-time Japan Racing Association licence. Moreira, a three-time champion jockey in Hong Kong, had intended to start a new chapter of his career in Japan. Those plans, however, were scuppered after he failed a test on the history of Japanese racing, rendering him unable to ride in the country once his current short-term licence expires this year. The SATs are what American high school students take to use for college entrance scores. I'd say the JRA test is more along the lines of the GRE (what college graduates have to take to enter post-graduate school for master's degree or PhD)... only *one* rider passed it this time. Australian jockeys Brad Rawiller and Brian Higgins suffered serious injuries after a heavy fall toady at Cranbourne. Injuries include fractured vertebrae and a collapsed lung. Saw the news on twitter a little earlier... my heart goes out to Violette's family and loved ones, and he's a loss to the sport as a whole, New York racing in particular.